West Meadow Elementary School opened its doors to friends and families for a Celebration of learning on March 27 and 28. It was an opportunity for parents to participate in student-led conferences and see some of the physical activities students were doing in the gym. There was also a book fair and a registration fair where parents could sign their children up for activities such as lacrosse; swimming; minor baseball; soccer; minor football; and badminton. 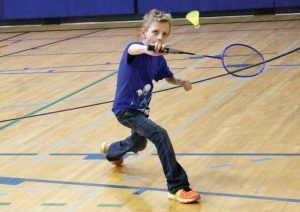 Here, Caleb Baker plays some badminton in the gym.